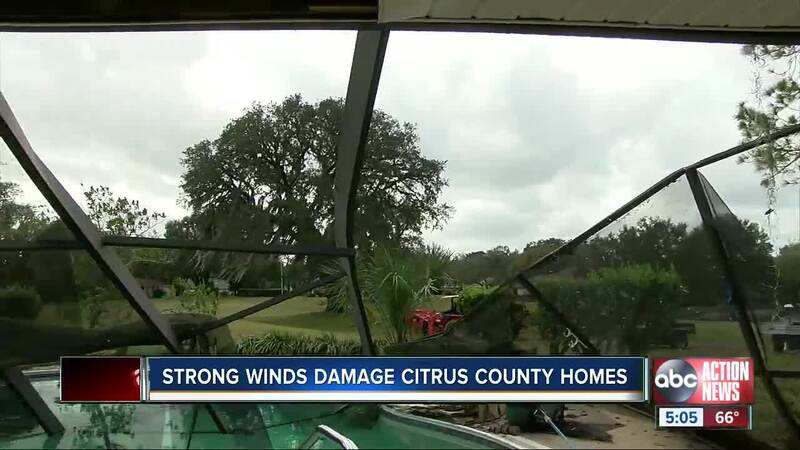 CITRUS COUNTY, Fla. — Strong winds created a mess for one Citrus County community, damaging multiple homes near the Citrus Hills Country Club. "It sounded like an explosion," said John Boyden. Boyden and his wife were in bed when the storm hit just after 4:30 a.m. Thursday morning. "The bathroom window broke and glass went all over the place," said Boyden. "I looked out here and I said, my God, what was that?" said Boyden. The National Weather Service says it was straight-line winds of 70 mph that caused all the damage. Neighbor Cary Jensen's home also got hit. "Something flew through one of our windows, which was one of our loungers from the pool area, and shattered all the way through the house and that's when we know it wasn’t something simple," said Jensen. The winds snapped metal signs, destroyed pool screens, uprooted trees and even picked a trash can and threw it nearly 50 feet up into a tree. Though multiple homes were damaged, neighbors are thankful that no one was hurt. "This can be fixed. Somebody getting hurt or killed can’t be fixed," said Boyden.